Hour-long chamber music concerts to thrill and inspire. 2018-19 season on sale now in London, Norwich and Saffron Walden. Just over 25 years ago, Britten Sinfonia was established as a bold reimagining of the conventional image of a chamber orchestra. A flexible ensemble of some of the UK’s leading soloists and chamber musicians came together with a unique vision: to collapse the boundaries between old and new music, to collaborate with composers, performers and guest artists across artforms and genres; and to create involving, intelligent music events that both audiences and performers experience with an unusual intensity. 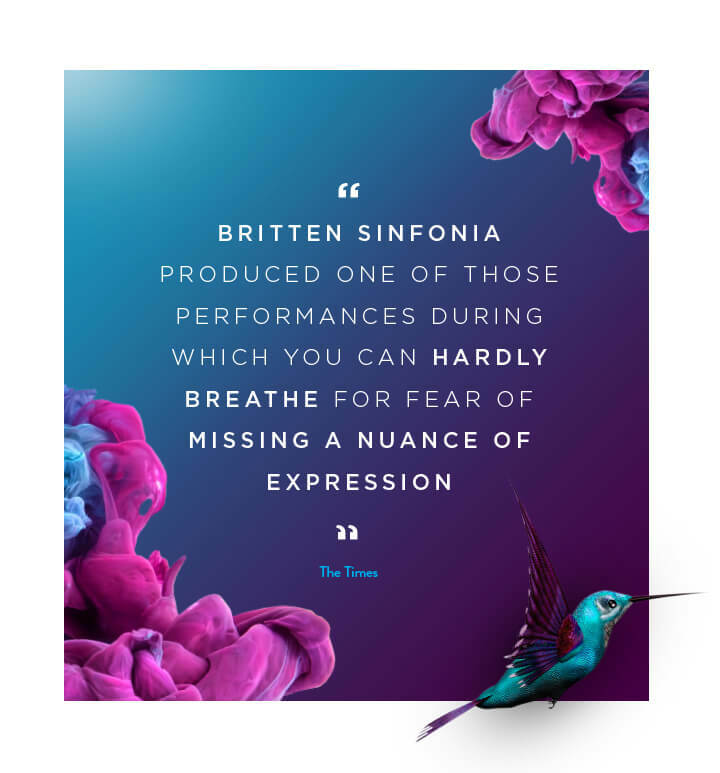 Britten Sinfonia is an Associate Ensemble at the Barbican in London and Resident Orchestra at Saffron Hall, with residencies in Norwich and Cambridge and performs a chamber music series at Wigmore Hall. The orchestra has a busy international touring schedule, appearing throughout Europe, the USA and Asia and its 2018 performance with The Sixteen at the Sistine Chapel reached more than a million people worldwide. There are few more thrilling things in British music than Britten Sinfonia on top form.